Back in July, we posted an in-depth guide on printer deployment with Group Policy Preferences. That article has generated a lot of questions about improving logon times, making management easier, and general best practices. Today, we are going to tackle each of those questions and establish some best practices for Group Policy Printer Preferences. Note:If you still have a question after this, be sure to leave a comment and I will add it to this list! Should I use Computer or User side printers? Computer side printers when possible. These printers install on startup and will save your users a good bit of time when logging in. If your machines are set to automatically start before the work day begins, computer side printers will have zero impact on your users! Setting a default printer is harder – we can sort of work around that though. Print queue management software (like Print Manager Plus) won’t be able to manage these printers. If you do have to use user side printers and are worried about login times, read this now. What should my CRUD method be? Printers can be set to Create, Replace, Update, or Delete (CRUD). Once you have the printer perfectly configured (including any default printer options set), configure the printer action to Create. Visually, it is easy to remember that a “Green” printer is good to go! This printer’s green icon means it is set to create. How can I set the default printer under Computer Configuration? Technically you can’t as the default printer option is disabled for computer side printers. However, you can work around this limitation. First, if your computers only have one printer – it will be selected as the default printer. If you have more than one printer, you will need to think about your deployment order. When printers are installed, the last printer linked for the user is the default printer. This is how we manage default printers in our environment. In your printer GPO, you will want to put your building wide/site wide printers higher up in the list and your more specific printers lower down in the list. The biggest issue we face is ensuring that software installed printers (like Adobe PDF) are not installed after a user has logged on. Finally, a good bit of user training will go a long way. Our organization has 20+ different sites. Each site has a unique personality. Sites that are babied tech wise tend to have more dumb problems. Sites that are trained (even through simple emails) tend to have less stupid issues. How do you name your printers? This question came from a reader who was just getting started with printer deployments and my answer was, “name the printer in the way that makes the most sense.” I like to see three things in a printer name: the site name, an exact location, and the printer model. In the picture above, I can tell all three things from the printer names. The site is BHS, the printer is in room 1102, and the printer model is a M401dne. Personally, I prefer the room/building location right after the site name as it makes finding printers easier when a user calls. Finally, you will notice that we pretty much use universal print drivers whenever possible. These drivers have come a long way in recent years and dealing with fewer drivers makes my day easier. Should I be setting a printer location? On your print servers, absolutely! Locations allow your users to easily search for printers near them. As seen in the picture below, locations have a weird annotations that are controlled through forward slashes. When you configure a location for each printer and then configure the Printer Computer location setting in Group Policy, you gain some serious scoping powers! For example, you can limit the number, type, and physical location of printers when your users search for them through the add network printer wizard. This is a really effective way of delegating network printer installations. The settings you need are found at Computer Configuration/Policies/Administrative Templates/Printers. How many printers can I put into a GPO? As many as you want! But ask yourself, “How often will I be changing this GPO?” If the answer is often, try to move the printers preferences closer to the computer by creating multiple GPOs. As a real life example, we have found that having a printer GPO per physical site works really well from a management and efficiency perspective. You can read more about GPO optimization here. If you have anymore printer deployment questions (or have your own tips), leave a comment below! Please Help! Joseph you are my ONLY HOPE! What happens is when in this configuration, my SECGRPs get the Printers correctly, but on each GPO update it goes through and removes all the printers and re-add’s them. This causes the default printer to change which is the main issue w/ this happening, but I would like to make it so that it only removes the printers when the user is NOT a part of the security groups. 1) Swapped Delete step and Update step. This seems to have something specifically to do w/ the DELETE step in this GPP it works correctly EXCEPT it keeps removing even when the user IS A PART of the SECGRP its trying to filter against. 🙂 and thanks for all of the details! Does the default pritner change if you change your printer action from update to just create? EDIT: It looks like you got a lot of replies on Spiceworks. Let me know if you still need a hand with this. Wondering is there anyway we can restrict Printing Preferences for Users. Actually users are default to Black & White but they can print changing this in Printer Properties when printing or in printing preferences. Any ideas please Thanks. I’ve finally started deploying printers via a GP. My users need a lot of flexibility with regard to setting their default printer as well as any preferences that might be unique to them. Here is the dilemma. We have quite a few mobile users that bounce around between offices and I would like the printers to install based on IP and then be removed if they log into another network. Otherwise they will end up with 40 installed printers. My understanding is that Replace/Remove this item when it is no longer applied is my only option to accomplish this. I have Replace running with item-level targeting based on IP and it’s working with some limitations. The default printer and the preferences get reset at every logon. Have I missed something in that Replace is my only option? You can actually do a delete all IP printers preference and make it the first preference to process (Order should equal 1). Then install your other IP printers after that and make their action CREATE. So you are saying using computer side preferences would be better and there would be little effect using item level targeting. Also what about using 750 printers in this. Yes. With computer side, you can control when the computers turn on (most of the time). Set them to turn on before users arrive and they will be at a pretty logon screen when a user is ready to use it. You just saved the user two minutes on every logon. Your ILTs are not having to go over the network currently so they aren’t heavy hitters. The 750 printers would impact when the policy is changed. 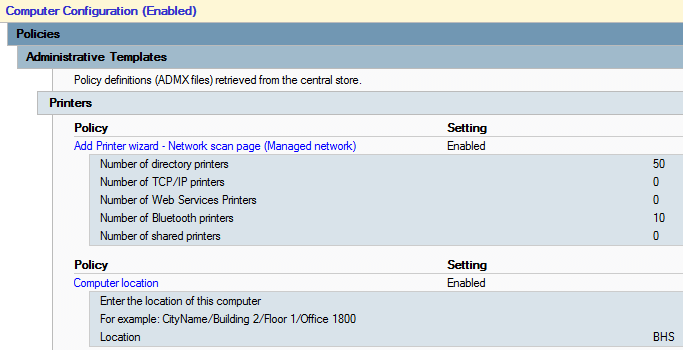 Does this GPO only containing printer preferences or does it have other items that change? What about using item level targeting using computer side preferences using the DNS name instead of IP? I would imagine the impact would be little either way. We have around 750 printers in 1 GPO using User Configuration each with a create and an update to install and set default. We also use item level targeting for the computer security group to validate against each one. As you can tell, it takes around 2 minutes on Applying Group Policy Printer Policy before moving forward. We have 4 major sites and lots of small ones. Do you have any idea how we can improve this? The policy does not reapply unless there is a change to the policy. My goodness that is a lot of printers in one GPO! My advise is to separate out the printers into specific GPOs and link those to the sites needing them. You can copy and paste Preferences between GPOs. If you can, consider moving them to computer side preferences. Then the burden is off of the logon. What are you thoughts on deploying User based printers in order to utilize shared printers BUT use Item Level Targeting to Computers within certain groups? I can create a printer preference, link that to a group in AD and than just drop the computer in that group. Thoughts? That is a fine way of deploying printers and I have used it many of times. It is a bit slower because of the AD queries but shouldn’t add much to your Group Policy processing time. I use the préférences with filters to deploy my 40 printers. The default printer selected by the user (if he have more than one printer) is not remember and change automatically for an other. Do you know How I can solve this issue? – I can’t select the default printer because it depend of the user location. I would set your printer action to create or update and uncheck remote if not applied. Those two settings can make items very tricky to troubleshoot. The replace setting is overwriting the users default selection. We started to use GPP to deploy printers and I like it much better than scripts. However if at one site we have 20 printers when the user logs in all 20 printer drivers are installed even if that person/computer is only supposed to get 3. Slows down the login process and we use the default printer settings. If we use Universal drivers for all the printers I wonder if that would speed things up somewhat. I deployed printers through gpo – printer preferences and applied to computer – however, it took over the default printer (a previously deployed printer) and whenever the user logs in, she needs to change back her default printer – I tried removing all installed printer from registry and restart – set default printer again, but it keeps on going back to the last printer I deployed through gpo printer preferences. Hi Bing – try redeploying the printer to the user and setting it to create. Let me know if the user can set the default printer again. Learn the best IT tips and tricks by subscribing. Who can shutdown your servers? Desktop Central - a replacement for WSUS, GPSI, and much more.